El domingo 1 de Diciembre fue el Examen oficial de lengua japonesa (Japanese Language Proficiency Test / 日本語能力試験). Este año va a ser imposible aprobarlo, ya que con aquello de estar enferma, no estudie prácticamente nada desde octubre… y el vocabulario se olvida y la gramática hay que practicarla. El año que viene será. Además, aprovechando aquello de que estaba en Madrid, conseguí pasarme por los Cines Golem, que desde el 29 de Noviembre ha estado pasando la película そして父になる (Soshite chichi ni naru, que viene a significar algo así como “Y se convirtió en padre”), bajo el título “De tal padre tal hijo”. 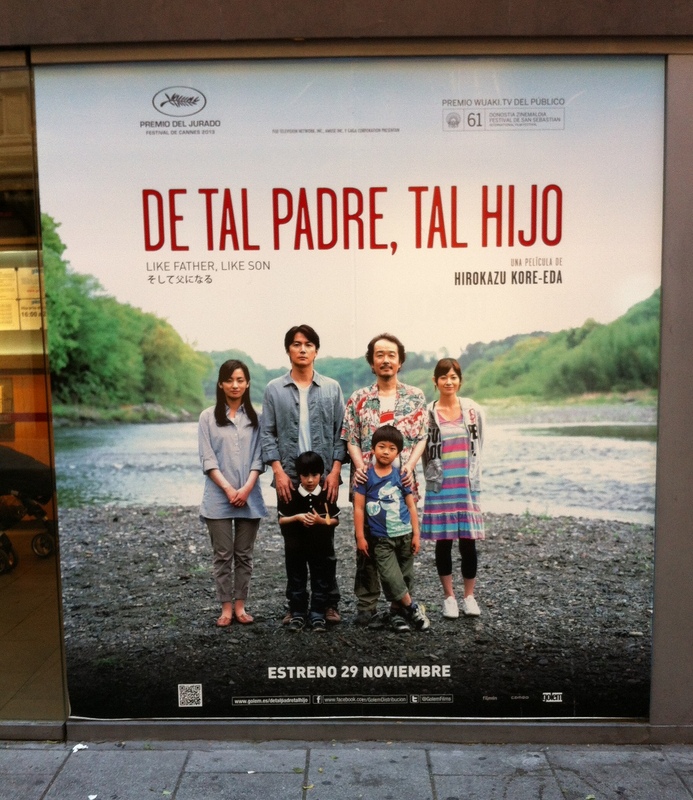 Since I was in Madrid anyway, I dragged Efficient Times to Golem Cinema, because since November 29th they are showing the Japanese movie そして父になる (Soshite chichi ni naru, which means something along “And he became a father”) aka Like Father, Like Son (“De tal padre tal hijo”). Soshite chichi ni naru won the Jury Prize in the 2013 Cannes Film Festival. Almost immediately Spielberg bought the rights with the intention of making a remake “with the same script and different actors”. Apparently that was the trigger that caused Soshite chichi ni naru to be released across Europe. I was lucky enough to find a cinema where it was shown in Japanese with Spanish subs. The movie was scripted and directed by Hirokazu Koreeda and tells the story of the average Japanese overworking father (Nonomiya Ryota, played by Fukuyama Masaharu). One day, however, his world shatters as he and his wife receive a call from the hospital where their son Keita was born – the boy is not their child, he got exchanged with another boy before. The two families meet. They are completely different, as the children are. The two fathers are oil and water, and the question everybody asks themselves is, what should they do? Keep the children, or exchange them back? Through the movie we mainly see how Rota evolves towards ‘becoming a father’. Like the stereotypical Japanese male, his main goals in life are prestige, honour and status, and although he does love his family, he has been neglecting them. While I am an open Fukuyama Masaharu fan and I might be a bit biased, I’d say he does a superb job representing Ryota’s change. Fukuyama is a master of body language when he acts (although he cannot pose for a picture to save his life). Downpart: Ryota’s wife, Midori, is underrepresented. Her role is completely secondary and she has nothing to say about the decisions that are taken. I am not sure, however, whether she suffers from the script, or if she is actually supposed to be like that – the stereotypical Japanese wife that the stereotypical Japanese husband lie Ryota would choose. 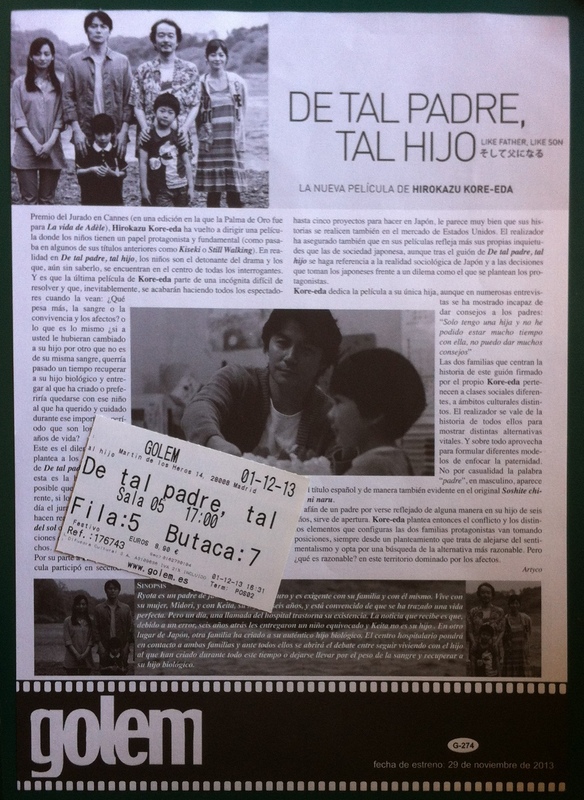 This entry was posted in Castellano, English, Films-Películas, Spain-España and tagged film, película. Bookmark the permalink.